Piano Prodigies LLC is a premier piano education program in Lebanon, New Hampshire founded by internationally-acclaimed pianist Elizabeth Borowsky. The program specializes in developing the talents of young students while inspiring a life-long love of music. The name of the program, "Piano Prodigies" is inspired by Ms. Borowsky's personal philosophies: 1. Everyone was born with tremendous potential and talent. 2. Talent must be nurtured and developed. 3. Students learn best when they genuinely enjoy what they are learning. With the guidance of a committed, knowledgeable, experience, encouraging, and enthusiastic teacher, all students will enjoy a wonderful musical experience that allows them to develop their musical gifts. Instruction focuses on setting up a solid foundation and providing students with the technical skills and musical understanding they need to thrive and grow long after their formal lessons are over. Students of all ages and levels of musical experience are invited to enroll in the Piano Prodigies program. Heralded by the press as “a brilliant young musician with a great personality,” Elizabeth Borowsky enjoys a versatile musical career as a solo and collaborative pianist, composer, educator, speaker, and recording artist. ? Borowsky’s scintillating musical personality has led to invitations to perform as soloist with orchestras around the world, including the Israeli Soloists Orchestra, Lublin Philarmonic Orchestra, Polish Camerata, St. Christopher Orchestra, Šiauliai Chamber Orchestra, Young German Symphony Orchestra, Tianjin Symphony Orchestra, and Towson University Symphony Orchestra. Her live performance of the Haydn D-Major Concerto with the Polish Camerata was internationally broadcast by Pol-Sat TV. She has been a featured performed at such distinguished venues as Carnegie Hall and The Kennedy Center, and has performed recitals in over thirty countries in prestigious music festivals including Klavierwoche International, the Maryland Arts Festival, Concerti di Primavera, Heidelberg Klavierwoche, Music at the Paderewski Manor, and the International Festival of Music and Architecture in Torun. Tuition includes weekly lessons, studio recital participation (minimum 4 studio recital opportunities/year), and additional recital, festival, and competition opportunities. See website for current rates. Ms. Borowsky has received numerous awards and prizes including the International Young Artists Award, Heidelberg Grand Prix, International Music Talent Award, Kosciuszko Foundation Graduate Scholarship, Pro Sinfonika Award for Promoting Classical Music Among Youth, Chopin Foundation of the United States Scholarship for Young Pianists, Maryland International Education Association, Merit Award from the U.S. National Foundation for Advancement in the Arts, and the Cultural Achievement Award from the Middle East Consortium of the International Friends of Music. In 2006, she was among the pianists invited to participate in the International Chopin Competition in Warsaw and was awarded the Acte Preable Prize for Outstanding Interpretation of Chopin's Music. Most recently, the Rhein-Neckar Kulturstiftung (Germany) awarded her an Artist-in-Residence grant to live and perform at the Dilsberg Castle. Member: Vermont and New Hampshire Music Teachers Association, Music Teachers National Association. Ms. Borowsky has been mentored by renowned pianists and teachers including Krystian Zimerman, Arnaldo Cohen, Andrzej Jasinski, Ann Schein, Ward Davenny, Brian Ganz, and Yonty Solomon. 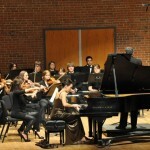 She has studied at Towson University, Trinity College of Music (London), and Indiana University - Bloomington. Let others know about Piano Prodigies. Did this teacher help you to learn? How long did you take lessons? Are you still playing music? Share any thoughts or stories you have so that others can know about this teacher!